She's always been a dog person. She's never seen a tree she didn't think about climbing. Everything else she had to learn along the way. Nan Marino always knew she wanted to be a storyteller but trying to figure out how to do it was not easy. First, she turned to music. Who can resist the poetic nature of song lyrics or those wordless melodies that sometimes tell the best stories of all? Besides she's always loved to sing. But Nan's dreams of being a music diva ended quickly when it became obvious at a very early age she's tone deaf and has zero musical talent. 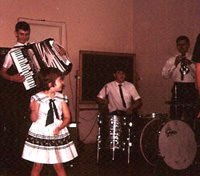 Here she is, giving her farewell performance at the age of four. Lesson learned: Even when you get the gig because your big brother is in the band, the music business can be a tough nut to crack. So much happened while Nan was growing up in Massapequa Park, New York. Some events rocked the world, like the Vietnam War and the first time a man walked on the moon. While others, like neighborhood kickball games, were important to only a few. Nan kept track of all these stories, and now she puts bits and pieces of her past into her writing. Lesson learned: Pay attention to what happens in your youth because you never know what memories you'll need when you grow up. As a teen, Nan wrote for the Massapequa town paper with BFs Deb and Kate. They had deadlines and a real editor, and they got to tell stories about what happened to them in high school. Here's one they wrote called “Death of a Pocketbook” about the day Nan left hers in a classroom. Lesson learned: Never leave the room without your pocketbook, especially if the next class is filled with school bullies and a substitute teacher because by the time you go to pick it up, your makeup will be splattered on the walls, your ID will be ripped to shreds and your faux designer bag will be thrown out the window. When Nan got older, she became a librarian. If you want to hear stories, it's the job to have. You'll find yourself surrounded by them. But, she still had to figure out a way to tell her own, so she began to write. After her first attempt, Nan was hooked. Sure, the odds of getting published were ten thousand to one. But she kept writing and learning and sending out her work. Nan tried not to let rejections bother her and gave all those no-thank-you letters to her dog, Chi. 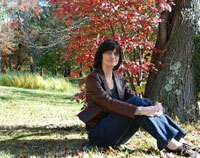 Finally, she landed a great agent, and Nan's debut novel was published in May 2009! Lesson learned: Even when the odds are against you, if you find your passion, go for it. Another lesson learned: Don't ever teach your dog to tear up paper because even a very smart dog cannot tell the difference between a rejection letter and a twenty dollar bill. Some day there may be more lessons because Nan is still writing and still learning. She hopes you'll check back.